"UN says that more than 10 million people are affected in areas of Djibouti, Ethiopia, Kenya, Somalia and Uganda. [...] "Two consecutive poor rainy seasons have resulted in one of the driest years since 1950/51 in many pastoral zones," the UN Office for the Coordination of Humanitarian Affairs told a media briefing. "There is no likelihood of improvement until 2012". Food prices have risen substantially in the region, pushing many moderately poor households over the edge. 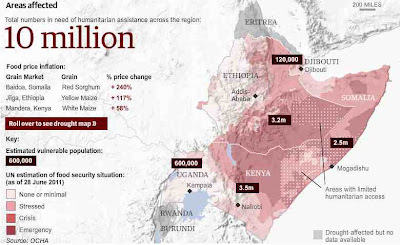 A UN map of food security in the eastern Horn of Africa shows large swathes of central Kenya and Somalia in the emergency category, one phase before what the UN classifies as catastrophe/famine -- the fifth and worst category"